With this brilliant novel, the bestselling author of The Mysteries of Pittsburgh and Wonder Boys gives us an exhilarating triumph of language and invention, a stunning novel in which the tragicomic adventures of a couple of boy geniuses reveal much about what happened to America in the middle of the twentieth century. 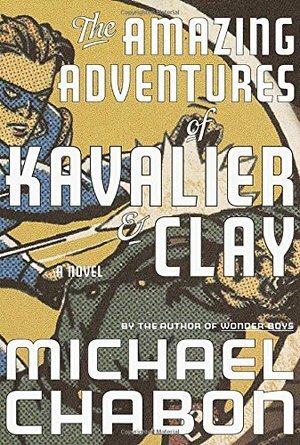 Like Phillip Roth's American Pastoral or Don DeLillo's Underworld, Michael Chabon's The Amazing Adventures of Kavalier & Clay is a superb novel with epic sweep, spanning continents and eras, a masterwork by one of America's finest writers. It is New York City in 1939. Joe Kavalier, a young artist who has also been trained in the art of Houdini-esque escape, has just pulled off his greatest feat to date: smuggling himself out of Nazi-occupied Prague. He is looking to make big money, fast, so that he can bring his family to freedom. His cousin, Brooklyn's own Sammy Clay, is looking for a collaborator to create the heroes, stories, and art for the latest novelty to hit the American dreamscape: the comic book. Out of their fantasies, fears, and dreams, Joe and Sammy weave the legend of that unforgettable champion the Escapist. And inspired by the beautiful and elusive Rosa Saks, a woman who will be linked to both men by powerful ties of desire, love, and shame, they create the otherworldly mistress of the night, Luna Moth. As the shadow of Hitler falls across Europe and the world, the Golden Age of comic books has begun. The brilliant writing that has led critics to compare Michael Chabon to John Cheever and Vladimir Nabokov is everywhere apparent in The Amazing Adventures of Kavalier & Clay. Chabon writes "like a magical spider, effortlessly spinning out elaborate webs of words that ensnare the reader," wrote Michiko Kakutani of The New York Times about Wonder Boys—and here he has created, in Joe Kavalier, a hero for the century.